The trilling sound is not exactly a meow. It’s more vigorous than a purr. Pretty and almost chirpy, the sound that’s coming from your cat can best be described as a trill. A trill is a quivering or warbling noise that sounds as if it could be coming from a songbird. Instead, it’s coming from your cat. So what is cat trilling, exactly? What Is the Mysterious Cat Trill? Experienced cat owners know that their furbabies make a surprising variety of sounds. Expect to hear purrs, meows, ferocious-sounding low growls that sound like a ‘57 Chevy in need of a new muffler. You might even experience banshee-like yowls, bizarre clicking noises, and of course, the pretty little chirps of a trill. A trill is definitely more than a purr. In a standard purr, your cat is almost letting her vocal machinery idle at the intersection. A meow is more deliberate and demanding, especially around dinnertime. You’ll notice that the kitty in the video is making a kind of “Brrr? Rrrbrrr? RRRRrrrb?” chirp with a rising inflection, as if he were asking a question. When Do Cats Trill at You? You may have noticed that your cat is extra-chirpy in the mornings or when she hasn’t seen you for a little while. You might be in for some happy chirps and trills when you walk through the door after work. Your kitty might also start trilling at the sight of the treat bag. If you’re thinking a cat trill is a form of positive, happy greeting, you’re absolutely right. Why Don’t Cats Simply Meow? Trills and meows aren’t quite the same. For one, they’re physically different. A trill is a sound the cat makes with a closed mouth, as opposed to the full open-mouthed commitment of a meow. In a trill, the cat pushes air through its vocal cords while the mouth remains closed. Trills and meows are different forms of communication. For one, trills are lighter in tone and tend to be associated with positive emotions from the cat. She’s happy to see you, or he’s delighted that you’re in the cabinet where the treats are normally kept. Meows, as cat owners definitely know, are not always communicating happy kitty thoughts. In fact, meows can often sound (and be) extremely bossy. They’re definitely meant to get your attention. Because they often communicate a cat’s needs, meows are an important part of the cat communication arsenal. Kittens are born blind and very vulnerable to predators and the environment. Meowing is one outstanding way to get Mama Cat’s attention. It’s no surprise that baby kitties meow much more often than adult cats. According to Amy Shojai, an animal behavior consultant and author of Complete Kitten Care, kittens start communicating their needs right away to get their mother’s attention. The mother cat hears the baby mewing and understands it needs warmth or milk or tending. Bottom line, meowing is a vital survival skill for kittens. Meowing lets the mother cat know when a baby kitten is tired, hungry, frightened, or cold. Mother cats are biologically hard-wired to respond to the cries of a kitten and help it. Ultimately, meows work for kittens in much the same ways that crying works for babies. Why Don’t Cats Simply Purr? Trills are delightful cat songs, but how are trills different from purrs? Are they the same thing? Just like trills and meows have different goals, purrs and trills are different kinds of cat communication as well. At some basic biological level, humans feel the mesmerizing calm of a cat purr. It’s not surprising to learn what Scientific American recently confirmed: listening to a cat purring can lower your blood pressure and heart rate. Moreover, the frequency of a cat’s purr can increase bone density and help the human body heal. However, a cat’s purr doesn’t only signal contentedness. Like meows, cat purrs are complex forms of communication that aid in a cat’s survival. During labor, according to Cat Behavior Associates, the mother cat purrs to release pain-dampening endorphins. Later, her purrs guide her kittens to her for care and nursing. Since they’re born blind and deaf, kittens can’t hear their mother. They can feel her purr, though. They quickly learn to go to the vibrations of her purring for milk, warmth, safety, and tending. For kitties, a purr means safety and security. Where Do Cats Learn to Trill? Cats learn most of their complex vocalizations from their mother. If you have lots of cats in a house, kittens will get to hear a wide range of sounds. These can include chirps, trills, meows, and (sometimes) hisses and yowls. This is all a normal part of cat socialization. Like human babies, kittens pick up on the sounds of the cats around them and imitate them. They learn that a cat trill is a sound you make when you greet someone, much the same way that a very young baby will learn to say, “Hi!” excitedly and wave her arms when she sees a new person. How Does Trilling Help a Cat? Some new cat owners feel concerned when they first get a kitten or full-grown cat. They know they’re not experienced in decoding a cat’s needs or wants. The good thing is that cats are very good at communicating with you and telling you what’s going on in their world. Trilling is one great way to kick off the conversation. If your cat comes up to you and trills, bumps his head against your hand, and arches his back, he is definitely communicating a greeting and a request for attention and petting. If your cat is chirping merrily at the bag of food or the cabinet where you keep the kitty treats, the message is pretty clear: They’d like to say hello to some food. Sometimes, though, your cat may trill right at you and walk away. Perhaps they look back over their shoulder. Maybe they repeat the process. In that case, your cat is trying to get your attention about something you need to see. They could be pointing out their empty food dish or calling your attention to their victory over the Christmas tree. Either way, your cat is telling you that there is something you need to take a look at. Trilling as an attention-getting device was a skill they learned as baby kittens from their mother. Trills always sound so happy and chirpy that it’s tempting to imitate them. Go ahead! Your cat may appreciate the fact that you’re genuinely attempting to communicate with them on their level. Since trills are a form of happy greeting, trilling at your cat is the equivalent of saying, “Hey, nice to see you too!” in response to their trill to you. 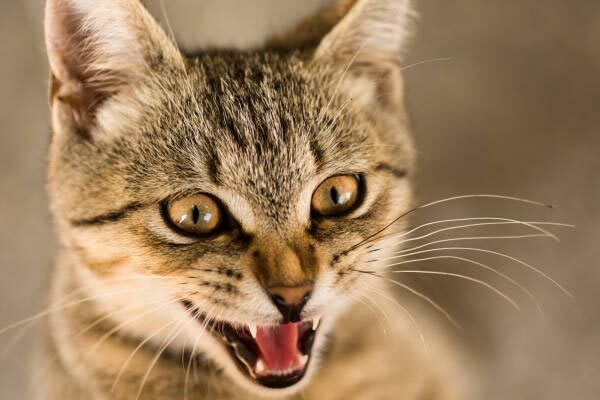 Can Cats Understand Us When We Meow at Them? Take a look sometime at cats interacting with other adult cats and you’ll notice something unusual: They don’t meow at each other. They definitely communicate with each other. They use body language, scent, touch, and even facial expressions, but not meows. Cats definitely meow at humans, though. Why are we in for the special treatment? One major reason is that cats like to communicate. Unfortunately, they’ve found over time that humans are terrible at understanding the nuances of cat language. We don’t pick up on body posture and social cues as well as we should. We also seem completely unable to understand the important nuances of cats leaving scent markers. We don’t “get” that important part of cat communication, mostly because cat noses are many times better at perceiving odors than ours. Bottom line, cats have to use the tools they have which actually work with humans. Cats use trills and chirps and yowls and meows as their go-to communication methods with people just as kittens do with their mothers. Sounds like trills and meows get our attention and we learn to “speak” that important part of cat language. Do Some Cats Trill More Than Others? Some cats are very quiet, but some are enthusiastic communicators. Cats who love to “talk” to you will generally use the full range of cat sounds they have developed in living with humans. These can include everything from gentle purrs to all-out caterwauls. However, some breeds are definitely famous (or infamous) for being quite chatty. For most people, Siamese cats tend to be at the top of the list of chatty cats. Siamese cats have a unique kind of voice, one that’s a little growly. They are very good at voicing their opinions about the world and the way things should be run. As you can see, the Siamese cats definitely want to warn Sharon of the horrifying danger of being in a glass room filling with water. Other breeds such as Oriental shorthairs, Sphynx, and Japanese Bobtails tend to be on the conversational side. 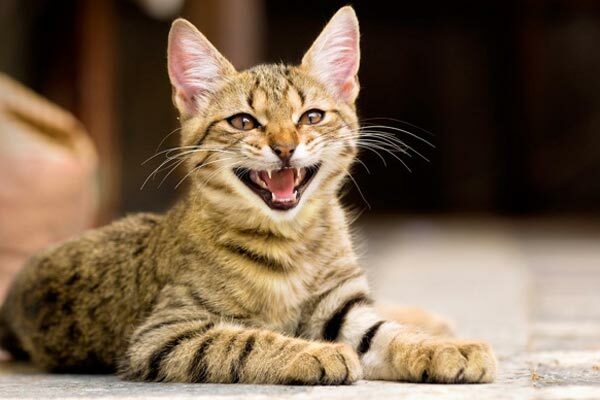 Cat owners who want a little more quiet in the house might want to consider an Abyssinian, an American or British Shorthair, a Russian Blue, or a Cornish Rex. Those breeds tend to be much more reserved. What If Your Cat Makes A Weird Sound That’s Not a Trill? Cats are fantastic communicators. The scent, body language, meows, and trills are only part of the cat repertoire. What if your cat is making a weird sound you can’t identify? It’s not a trill or a meow. Could there be something wrong with them? One question to ask is this: What is your cat doing when they’re making this unusual sound? If your answer is “Sitting at the window looking at birds,” then play this video. If you hear a repetitive clicking that sounds almost like an old-fashioned rotary dial phone, then don’t worry. That’s a cat click. Unlike a trill, which cats use as a form of greeting or attention-getting, a cat click is a survival hunting tool. Cats learn to mimic this bird-like sound in order to lure prey close enough to attack. It may not always work, even on very inexperienced birds, but the odds are good that your cat will try it at some point. My Cat Makes Too Many Noises! What Do I Do? Before you get a cat, it’s important to research the breed first. All cat breeds have their pros and cons. A quality you may love may not be the perfect choice for someone else. In addition to considering gender, age, and hair length, it’s important to look at how “chatty” you want your cat to be. It’s also important to understand that all cats are unique. Each breed has its overall tendencies that you may or may not prefer as a cat owner. Even if you do your homework, the specific cat you choose may not fit into the typical behavior of its breed. You could get a silent Siamese or chatty Abyssinian. How Do You Change a Cat’s Behavior? So what do you do if you just hear too many chirps, trills, and meows out of your kitty? If you think the noise issue is a lost cause because cats can’t be trained, think again. Cats are intelligent and social and do respond to reinforcement. The reinforcement has to be the right kind. First of all, never ever use physical discipline on any animal. This includes making painful or forceful contact with the cat in any way, including squirt bottles. Even though it might be the first instinctive action you might want to take, yelling at your cat is completely counterproductive. Cats simply do not learn this way. In fact, all you’ll do is stress the cat and cause further behavioral or health problems. You want a happy household with a loving pet. The last thing you want to do is make your cat fear and distrust you. It’s understandable that if you’re trying to sleep and your cat is trilling, chirping, and meowing in your ear at two in the morning, something needs to be done. First, find out the reasons. One reason cats make noise is to alert you to something being wrong. As Web MD for Pets points out, excessive meowing and noise-making can be a sign of trouble. You may need to take your cat in for a veterinary visit. Many diseases that affect cats can make them hungry or thirsty. They may also be in pain. A vet visit may help to rule that out. Overactive thyroid and kidney disease are often underlying reasons why your cat starts to make a lot of noise out of nowhere. Additionally, your cat may be in heat (or there may be a female kitty nearby who is). That’s another reason your cat is letting you know they’re upset. 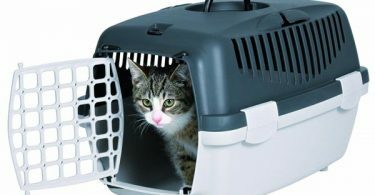 It’s important to determine whether your cat’s chattiness is normal and not a sign that it is injured or sick. If you need your sleep at night, try putting the cat in a separate room with food, water, bedding, and a litter box until you’ve figured out the problem. Can You Train a Cat to be Quiet? We love cats for their intelligence, but that independent streak of theirs makes traditional training a challenge. However, cats are very motivated by rewards in the form of food. Using a clicker (a small handheld device that makes a very distinctive “click” sound when pressed), you can train your cat that quieting down can get him a reward. In this video, for example, a cat behaviorist patiently works with a cat named Romeo to communicate to him that not meowing gets him a treat. It’s important to communicate with your cat by rewarding good behavior. Notice how it’s also important to wait for the right moment. Wait for the time when the cat demonstrates the action you want them to repeat. Focusing on that one idea will help your cat make the positive association between “I stop meowing” and “I get a treat.” The clicker helps call attention to the moment. Can You Train Your Cat to Trill? Trilling is such a pretty little cat-song with its cheery “brrrp?” sounds. If you can discourage a cat from meowing too much, can you train your cat to trill more? Research into cat behavior definitely suggests trill-training might be worth a try. 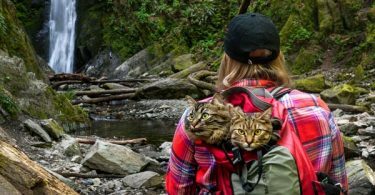 According to Mikel Delgado, a postdoctoral researcher studying animal behavior at the University of California, Davis School of Veterinary Medicine, cats are amenable to being trained. You have to understand the rewards that motivate a cat. Delgado points out, for instance, that if a cat climbs on the counter and you yell “No!” and pick him up, you’re actually communicating something very different to the cat than you think. Your cat doesn’t read your actions as scolding. Instead, they see it as lots of positive attention. After all, there you are, paying full attention to your feline. Don’t be surprised if your cat climbs back up on to the counter again. Why not? You made it so much fun for them the first time. When it comes to trilling, you can use that understanding of cat psychology to your benefit. Cats are highly motivated by attention and by food. To give them both is a fantastic one-two combination to promote the kind of positive behaviors you want your cat to show. First, be observant and ready. A trill is a happy greeting and way of saying, “Hi!” If your cat already trills a little, it’s probably when they first see you in the morning or after you come home from work. If your cat trills, give them the treat. If you have a clicker, it might be a good idea to use the clicker as a way of “marking” the moment in your cat’s attention. You may want to trill a happy “Brrrp!” back at your cat to reinforce the communication bond. Unless they’re kittens, cats don’t meow at each other, but they definitely trill back and forth as part of their cat conversation. By trilling back to your cat, you’re tapping into communication patterns your cat knows and understands. The treat rewards them for this action. If they trill again, give them another treat or partial treat. Along with the treat, you probably want to pet them and give them that positive praise and attention they want from you. Rubbing your kitty’s ears or petting its back is a clearly positive way of reinforcing the bond you have with your cat. Expect to be trilled at more often. Why Doesn’t My Cat Trill? In some cases, you may find out that your cat isn’t much of a triller. There are a few possible reasons why that might be. Some of those reasons range from personal experience to general breed characteristics. Cats learn to trill as kittens. Since all kittens are born blind and deaf, they learn to survive by being attuned to their mother cat’s purrs, meows, and trills. As kittens grow, they learn that trilling is Mama Cat’s way of saying hello. If your cat doesn’t really trill when other cats of a similar breed do, then this lack of trilling might be due to early separation. The best time to separate a kitten from its mother is when it’s approximately 12-13 weeks old. Cats generally wean themselves at around ten weeks and can eat solid food by themselves. By 12-13 weeks, baby kittens have had some time to be socialized by interacting with their mother, other cats in the house, and with their littermates. They’ve learned Cat 101, in short. This includes learning to trill at their mother or their siblings. If your cat does not trill, it’s possible that this separation happened too soon. Trilling is social conversation that cats engage in with each other. As any cat owner knows, though, not all cat personalities are alike. Even in cats of the same breed, one may be the center of attention and the life of every party, but another one might engage in the classic cat aloofness we know and love. If your cat’s approach to new people is outgoing, they may engage in a lot more trilling and conversation. They’re like that bubbly person at work or school who comes up to you full of energy and ready to tell you all about their weekend. On the other hand, a non-trilling cat may keep more to themselves. Positive reinforcement like attention and treats can encourage your less-social cat to come out of its shell. What Are Some Really Social Cats Who Like to Trill? Although every cat is unique, there are some behaviors that tend to be associated more with one breed than another. If you like a trilling, conversational cat, finding a cat from a historically friendly, social breed is probably a good place to start. Some of the most generally social breeds include Scottish Fold, Tonkinese, and Ragdoll cats. Scottish Fold cats have gotten famous in recent years due to Taylor Swift and Olivia Benson, proud Scottish Fold owners. These fluffy, round-eyed cats with their distinctive ears adorably folded down are very affectionate as a breed. Tonkinese and Ragdoll cats are also known for their affection and desire for attention. If you like a chatty cat, Tonkinese are very vocal. Bottom line, if you want a conversational, social cat who loves to communicate with you, these breeds are a great place to start. Reward your cat’s trills with positive attention and love. It’s very possible that they can learn to trill even more. There’s something so positive and musical about the pretty cat song of a trill. It definitely means your cat is happy and healthy and glad to see you. Cats, especially the more social breeds, love play and attention. What are some great ways to keep your cat happy and entertained? Your cat trills when they want you to pay attention to them. Ear scratches and belly rubs are great, but playing with your cat is part of the joy of being a cat owner. The classic ball of yarn is a wonderful addition to cat play, but for even more fun, think outside (and inside) the box. A remote-controlled mouse can be an incredibly fun addition to your cat’s play time. Your cat’s prey drive is very strong, and having a remote-controlled mouse can help them satisfy those primal urges to catch little critters. The cat wand remains a perennial favorite for good reason. It’s a great one-on-one game to play with your cat. Dangle one of the colorfully feathered attachments at the end of the wand and watch your cat try to hunt it down. You might also try trailing the lure across the floor for your cat to chase. It goes without saying that where there is a box, there will be a cat. To take your box game to the next level, try to turn a box into an entertaining labyrinth for your cat. With only some tape and scissors and a few cardboard dividers, a simple box can be a great source of playtime fun. Ultimately, cat trills are a great sound. Chirpy and pretty, they’re a sign that your cat is happy, secure, and glad to see you.